We arrived in Vietnam flying into the typhoon Wutip. Both times we managed to fly into the storm and out of the storm just in time…but what a strange feeling of being at the mercy of the elements. A strong wind is something totally different than a typhoon or a cyclone or a hurricane ! 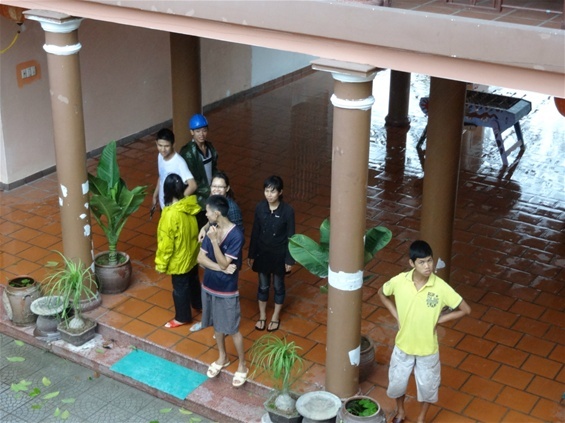 In TTg (www.eurasia.org.vn or www.Tinhtrucgia.ch ) the team spent hours securing roofs, trees, windows, flowerpots, the construction sites…all this under pouring rain and ghastly winds. And yes we are happy to say that almost no damage was done . 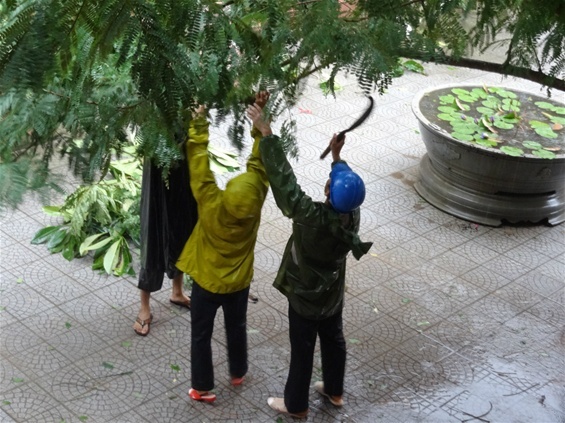 During typhoon Wutip , Mr Tu and Mr Hung where still in India so it was Mrs Trinh like a captain on a ship guiding the preparations for the storm…sandbags of some roofs, cutting branches from trees, securing electricity poles, trees, all sorts of material that could fly away ! It was impressive !!!! The two weeks in Hue were so intense in work, meetings, planing new projects, training courses etc that we felt a bit in need of digesting, and resting. We had planed a BIG Eurasia event on the 12th but because of the funeral and national mourning for General Giap, this event was cancelled so we thought, let’s have some rest instead ! Tho hardly had any days of rest since 1 year !!!! May be 1 week hollidays this year ? On the Saturday 12th afternoon it was still nice weather, but suddely on Sunday the winds got stronger and stronger and the hotel we stayed in announced the typhoon Nari will hit with 150km/h winds and ghusts of 200km/h Hoi An…so we decided to leave and luckily found seats on the almost last plane to leave Danang. Nature is strong if she awakens with anger and despair !